Ever since Biafra struggle started, right from 'Chukwuemeka Dim Odumegwu Ojukwu' till this day of 'Nnamdi kanu' Biafra Quest has been experiencing betrayals, mostly from South-Eastern region. Few days ago; the claimed criminal leader of Ohaneze Ndigbo 'Nnia Nwodo' organized a conference in Lagos and tagged it "addressing Igbo people in Lagos". What a shame that the claimed coward 'Nnia Nwodo' did not see all the states in south east to organize and address conferences but in another man's land, Lagos. His(Nnia Nwodo) speech in Lagos will let the leadership of IPOB and all Biafrans to know that is time for a revolution, time for letting all the betrayals to know that we own Biafra land and we say what we need in Biafra land. 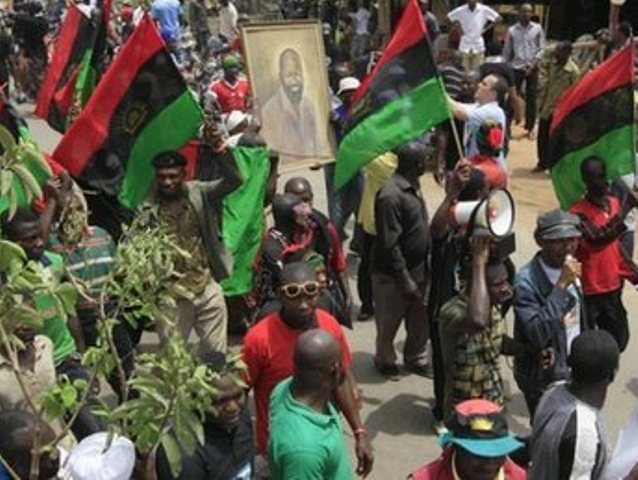 It is not right to allow few numbers of idiots who call them-selfs leaders of Igbos to continue in betraying the Biafra struggle which they may think that anything they say is final. Why will their be war again? Who is he afraid off? Why is he afraid of them? What good impact has he (Nwodo)made since he is Ohaneze Ndigbo? Putting up the answers to this questions, you will see that 'Nnia Nwodo' has nothing to offer to Igbos. There may be war between him and FG due to the benefit he always gain from the huge amount of bribery, their will be war because Hausa Fulani's has no impact to make in the country rather they will embezzle the money and use it to bribe Nwodo and his cohorts, so tell me why there won't be war? Nwodo make the comment in Lagos because he wont be able to pay for the money he has taking from them, he has been bribed in line with his members and south east governors aswel, he is afraid of them taken away the Ohaneze Ndigbo out from him. I cannot count nor say that this is what the so called Igbo leaders has done for the Igbo people, rather damages. Nothing good has come out from them if not taken bribe from the federal Government and then come out to tell Igbos openly that he will sabotage the Biafra struggle to avoid war. Our forefathers are not cowards and betrayals but the present thief's that called them-self father's are bunch of criminals and fools that does not have any value for them-selfs. Rochas the governor of Imo State has ones make a speech that Biafra quest is Nonsense few days ago, what they are all after is their wealth and popularity. Isn't a shame that the south East governors and 'Nnia Nwodo' are the master planner of the invasion that took place in Nnamdi Kanu's residence by Nigerian Army to kill and kidnapped Nnamdi kanu and his parents which their way about is still yet unknown. Is high time the leadership of IPOB and Biafrans at large strategies a plan to deal with these bunch of criminals that called them-selfs leaders before things get out of hand. We have lost our brothers and sisters uncountable times and no one speak against it even the saboteurs that called them-selfs governors and Ohaneze Ndigbo, all of them were mute which shows that they are not supposed to call leaders, they all lack the charisma to lead. It will sound somehow if at the end, those betrayals and those saboteurs are left to go free without maltreating them to let them know the outcome of what they have cost us in these struggle. I rest my case..